Del Webb, the nation's leading builder of active adult communities for those 55 and older, has announced two new communities coming to the Jacksonville area: Del Webb Nocatee and Del Webb eTown. Both Del Webb communities will open Summer 2019 with new homes starting in the mid-$200s. Del Webb eTown will offer 346 home-sites and include over five acres of resort style amenities, fitness paths and pocket parks. eTown is a new smart living community built around the belief that convenience, community, technology, and sustainability enhance a modern way of life. Located off SR9B near I-295 on the southside of Jacksonville, residents will be less than 10 minutes from over 200 retail stores and restaurants at the St. Johns Town Center, as well as centrally located to the area's elite hospitals. 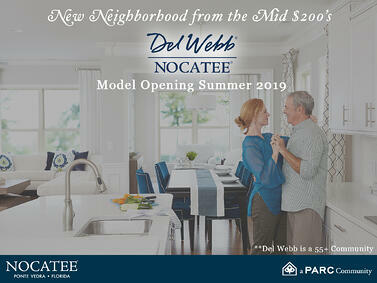 Del Webb Nocatee will offer 854 home-sites and include a seven-acre, resort style amenity center with pools, tennis, pickle-ball, fitness and a 20,000-square-foot clubhouse with numerous social activity spaces. Several homes will be situated on home-sites with natural preserve views. Nocatee residents are in close proximity to Ponte Vedra Beach, world class golf courses, and historic St. Augustine. The master-planned Nocatee community is home nearly 7,000 families. Each community will be among the first in the country to launch Del Webb's new lineup of villa and single-family floor plans. 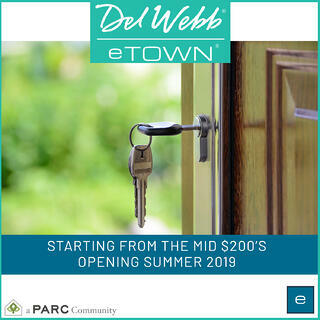 To join a VIP interest list or sign up to receive more information, visit these new Del Webb eTown or Del Webb Nocatee web-pages. Currently, Del Webb Ponte Vedra (in Nocatee) is nearing closeout of its single-family homes and condominiums. For more information about eTown, follow eTown on social media or visit eTownJax.com. Social media: Facebook, Twitter and Instagram.